And before all that lovely-dovey stuff makes you feel guilty because you surely don’t feel that way about reading your Bible, did you check out my post the other day, Bible Quotes About God’s Word, where I admitted sometimes reading my Bible seemed like a penance? Yes, I said that. In those times though, I ask God for the desire to read His Word and I know He not only hears that prayer but honors it as well. 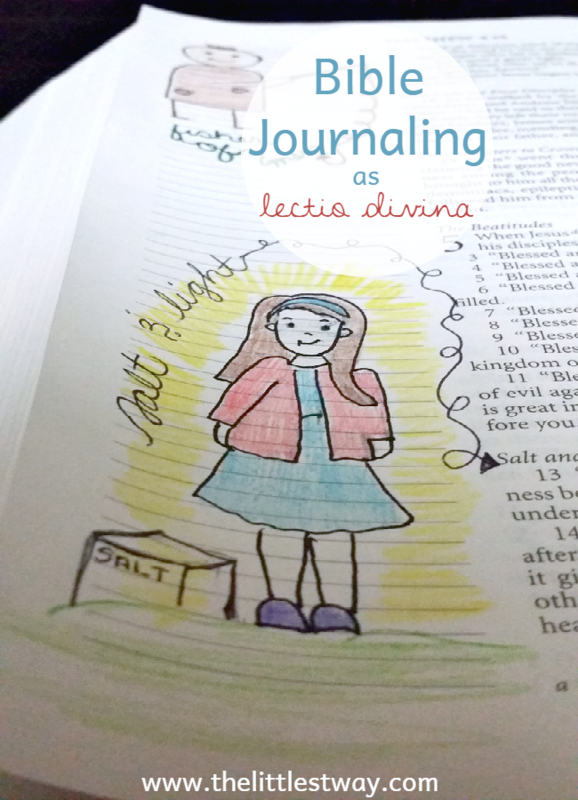 So how do my attempts at Bible journaling work within the confines of lectio divina? Extremely well! I sit down and read the text, the assigned reading for the day from our Read the Bible in a Year plan or from a One Year Bible. As I read it, I read it with an open heart and mind, waiting for a certain passage to stand out to me; a verse or even just a word that makes me stop and go back to re-read it. Lectio. states, “Christian meditation makes full use of the intellect in an effort to understand God’s Word and to hear God’s voice. Christian meditation is the pursuit of understanding, starting with the fruits of lectio.” I’m spending this time considering what this verse means to me. Why did the Holy Spirit bring me to a pause on these words? As I’m meditating, I must keep in mind, all Scripture affirms the teachings of the Church and the teachings of the Church are in agreement with the Scriptures. If my meditation begins to lead me down a path away from the Church, I have misinterpreted the passage. During our lectio or meditatio, our heart might be stirred by one particular observation. Stop there. Don’t just continue on to the next thing. Take time to go deeper and let the Holy Spirit move your meditatio to the next stage of your journey through lectio divina. Remember when I encouraged us not to beat ourselves up if we didn’t finish a book on a list in the appointed time. (The Spirit of Perfection) This is one of the reasons why. It is much more fruitful to take time to listen to the Father admonish, teach, or affirm us in His Word than to say we marked off Day 9…on Day 9. I’ve decided for this year, I will not get behind in my Bible reading schedule. If I miss Day 10 on January 10th, I’m just going to pick up where I am supposed to be on January 11th. If I have time I can go back, but I decided I’m always going to be right on track day today. This will eliminate any feelings of being behind…maybe even too far behind that I just give the whole thing up. To keep track of what I’ve read when, I date each section of Scripture with the year in which I read it. My sister is putting a piece of washi tape on the edge of each page she has completed. Next on to prayer–oratio. Prayer is a conversation with God. Speak to Him. You can speak to Him in writing, out loud or in the quiet of your heart, but just start a conversation. And again, how does this ancient practice of lectio divina work well with the seemingly new practice of Bible journaling? The monks who practiced lectio divina carefully recorded in their personal notebooks or journals the key verses that struck them in prayer or liturgy. Like a honeybee collecting nectar, they would gather these precious Scripture passages for further meditation. As the monks did this they came up with a further practical insight, they realized it helped to write down, slowly, these precious Scripture passages that spoke to them, so that they could be etched into their hearts. Well, that sounds a lot like Bible and Prayer Journaling to me! When I read the passage in Matthew 5 about being salt and light, those words gave me pause. What does that mean for me and to me, to be salt and light? But instead of slowly writing the phrase, I found a pretty little girl to trace and framed her with the phrase. Writing or creating, either way, I spent time with those words. And finally contemplation–contemplatio. Jacques Philippe states, “Contemplation comes from a deeply personal contact with God, and that is why method is the least useful at the point where prayer is the most personal.” Do you know what that means?! We can’t “do it wrong!” FREEDOM! On the other hand, it also means for someone like me, there is not a “do this, then this, next that…” printable. defines contemplation as a gaze of love. I need to not worry about what to do and how to do and when…I just need to look with my heart, mind and soul, to God. Worrying about doing it right, will likely hamper my gaze. Those fears and doubts will be like a cloud cover and I will be unable to see God through them. How awesome that this practice of lectio divina will also be a practice of letting go, trusting that God will hear me, love me and respond to me not because of what I am doing but because of Who He is. I’ve written a book, Bible Journaling Tips, Inspiration and Permission, to encourage and inspire you in your Bible journaling! I received the book mentioned free for an honest review. All opinions are my own. Thank you for this. I’ve not heard of this Bible yet so I will go check it out. God bless. 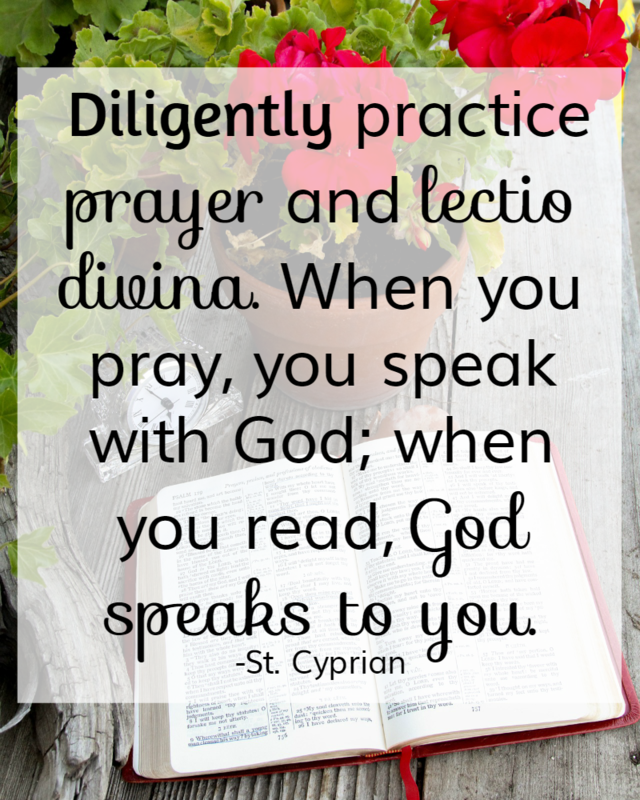 Your post was a great lesson on Lectio Divina. I Love to read my Bible in this way and is perfect to practice during Lent! Thank you! Jenny, I have enjoyed so much your posts! I had nonidea what Bible Journaling meant. I thought it was just the process of writing in a journal the fruit of praying with the Bible. But finding your website has added a new layer of how I can interact with my Bible. I always used Lectio Divina as my preferred method of praying the Scriptures and I always highlight my favorite verses. But now I can add color and an image that makes me dwell in that verse. This is perfect for the “Contemplatio” part of LD! By the way, my Bible Journaling doesn’t look as elaborate an beautiful as some I have seen on the internet and I don’t have a wide marging Catholic Bible in Spanish to do that, but I found a way to still add color to my meditation and I’m enjoying it immensely! Thank you and God bless!!! Hi Veronica. I am so happy to hear that you have not let comparison keep you from Bible journaling. As you can see, mine doesn’t look like the rest of the internets either. This is another area where we can see how God made each of us differently. 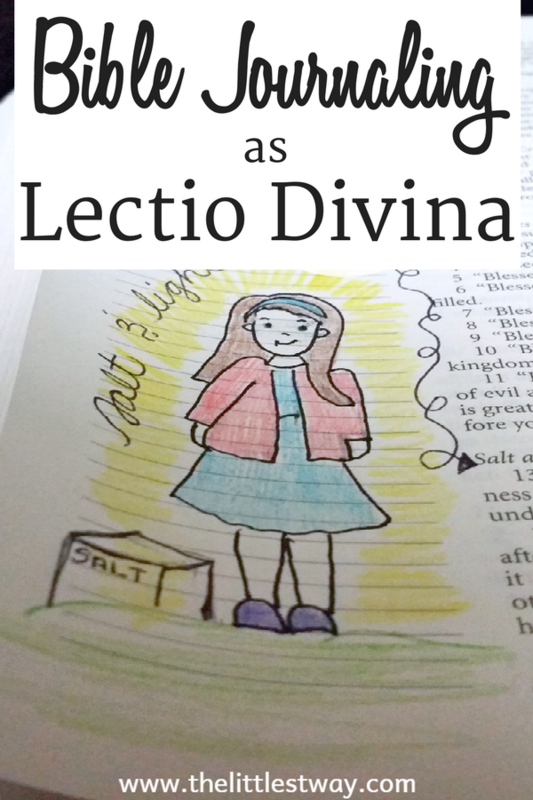 First of all, I love lectio divina! It has a way of breathing life into the scripture. When I practice it I always start with a prayer calling upon the Holy Spirit to come and reveal the father’s will for me. When doing this alone, I like to journal and then highlight or underline the word or phrase that’s speaking to me. I was in a prayer group once where we did this together and it was so neat to see how everyone responded differently to the passage and from that I gained new insights as well. What Bible are you using? I’d love to find one that has a place to jot notes or doodle something in the margin instead of the crazy notes that are here there and everywhere in my current Bible. Hello, Jenny! I “stumbled upon” this post when looking up “Lectio Divina” and recognized your blog! I am currently doing the 31 Day challenge; but was looking for info for my Simple Woman’s Daybook post…and will also be sharing “Lectio Divina” in a “1000 Gifts” post. Thank you for sharing this information! I used the image; I really love that quote! And, plan to read – more carefully! – your entire post. I love the Bible journaling that others are doing, especially the art journaling; not quite that artistic to want to “mess up” a Bible myself! Hi Barbara and welcome! Let me know if there is something you are looking for and cannot find. Fortunately there are so many ways to practice Bible journaling that don’t require messing anything up, lol!